SystemVeteran is a rogue antispyware program from WiniGuard family. It classified as rogue antispyware program because it installed through the use of trojans and uses false scan results and fake security alerts as method to scare you into thinking that your computer is infected in order to trick you to purchase a paid version of the software. When the trojan is installed, it will download and install SystemVeteran onto your computer. The trojan will also create a lot of harmless files with random names and will register SystemVeteran in the Windows registry to run automatically every time, when your computer starts. 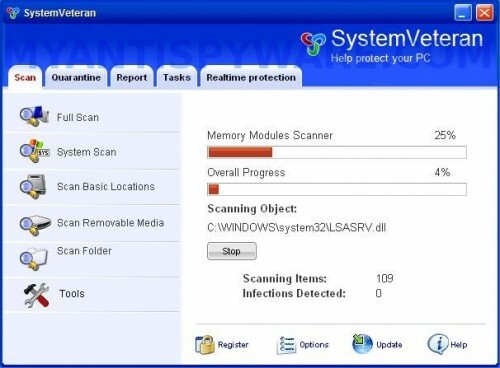 When SystemVeteran is installed, it will perform a scan of your computer and list files previously created by the trojan as infections that will not be fixed unless you first purchase the software. All of these infections are fake and cannot harm your computer, so you can safely ignore them. The same trojan that installs SystemVeteran will also display fake security warnings from Windows task bar. Like scan false results, these warnings are all fake and should be ignored. The trojan will also show a fake Windows Security Center. The fake Windows Security Center will suggest you purchase SystemVeteran to protect yourself. Instead of doing so, follow these SystemVeteran removal instructions below in order to remove this infection and any associated malware from your computer for free. Make sure the “Perform quick scan” option is selected and then click on the Scan button to start scanning your computer for SystemVeteran infection. This procedure can take some time, so please be patient. Make sure all entries have a checkmark at their far left and click “Remove Selected” button to remove SystemVeteran. MalwareBytes Anti-malware will now remove all of associated SystemVeteran files and registry keys and add them to the programs’ quarantine. When MalwareBytes Anti-malware has finished removing the infection, a log will open in Notepad and you may be prompted to Restart.